Delaware County is still feeling the effects of Friday's nor'easter with downed power lines and trees leaving 1000s still without power on Monday. About 48,000 PECO customers and 5,600 PPL customers were still in the dark on Monday afternoon. 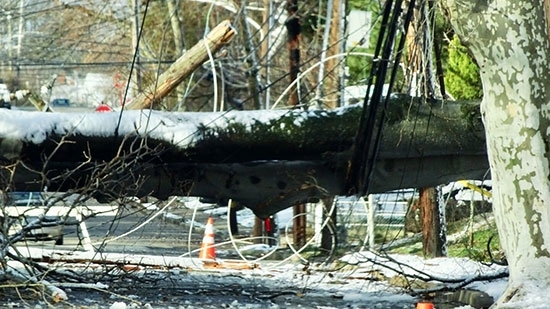 At its peak over 600,000 customers were without power across the region. Haverford Township was hit especially hard. Crews have been working non-stop to clear the fallen trees and reconnect power lines. Schools were closed on Monday. A disaster emergency was declared over the weekend and Governor Wolf has deployed additional resources to the county. Just as the area rebounds from Friday's storm and subsequent damage, forecasters are looking at another nor'easter to come up the coast late Tuesday through Wednesday. This storm will feature wind, rain, and snow. Compared to last week's storm there will be less wind, but more potential for snow, especially north of the city. A firefighter was injured while battling a blaze in Bucks County overnight. It happened around 2:30 Monday morning on the unit block of Henry Avenue near Bridgetown Pike in Feasterville. The Trevose Fire Company firefighter fell through the floor while inside the home. He was alert and conscious when taken to Saint Mary Medical Center. No one was home at the time. The fire was brought under control by 3:30 a.m. The cause of the fire is under investigation.